Description: The horrifying amalgamation of Stirrix and Toby, nicknamed “Stobyx”. By the end of ‘Chapter 3: The Wooden Witch’s Pet’, Stirrix reveals that he can take off his armour and attach it to any living creature, meld into it and transform it into a terrifying monster that carries his visage. This is an ability that only Skorned Captains obtain, and is another recognisable trait of how to perceive them as Captains. Skorned Captains have this ability presumably because Skolliath gave it to them, and thus he feels they are willing to take the risk to even use the ability. The risk being that the process of morphing into a monster requires the Skorned’s armour to be taken off. Because the armour is the source of their existence, taking it off risks them vanishing shortly after, so if they need to meld into another creature, they better do it fast. Furthermore, the Skorned Captains themselves do not even know the result of a transformation. Not every transformation leads to a gigantic creature, and sometimes the end result could even be a weaker form than their normal form, or maybe even a form that does not benefit their current situation. As a result, monster transformations are to be done wisely, and usually as a last resort. Especially because the transformation process leaves the armour point vulnerable to attack, making it unwise to transform in front of a smart opponent. Sometimes in their new transformed appearance, the Skorned Captain also inherits new abilities as well. In Stirrix’ case, melding with Toby granted him powers of Wind. This includes blasting beams of wind energy from his mouth, causing huge gusts of wind with a flap of his wings, and summoning tornadoes at will. Again, this does not always happen with every transformation, but Stirrix was rather fortunate it worked with Toby, and thus he took full advantage of his powers in his battle against Artie. The Skorned Captain can revert back into their normal form anytime they want. This also turns the other creature they melded with back to normal as well. As was discovered by Artie in ‘Chapter 4: Identity of the Shadows’, it is entirely possible for the other creature to return safely back to their normal form even when their armour points are destroyed in their transformed look. Albeit with a massive headache. In this case, Toby returned safely back to his normal form after Artie defeated Stobyx in battle through the ultimate slam dunk. Appearance: Stobyx is a giant owl creature that borrows both assets of Stirrix’ and Toby’s design. He borrowed Toby’s owl appearance, while borrowing the girth, colours and fat of Stirrix’s design. He is covered in purple feathers that like a Skorned’s fur are made out of darkness. 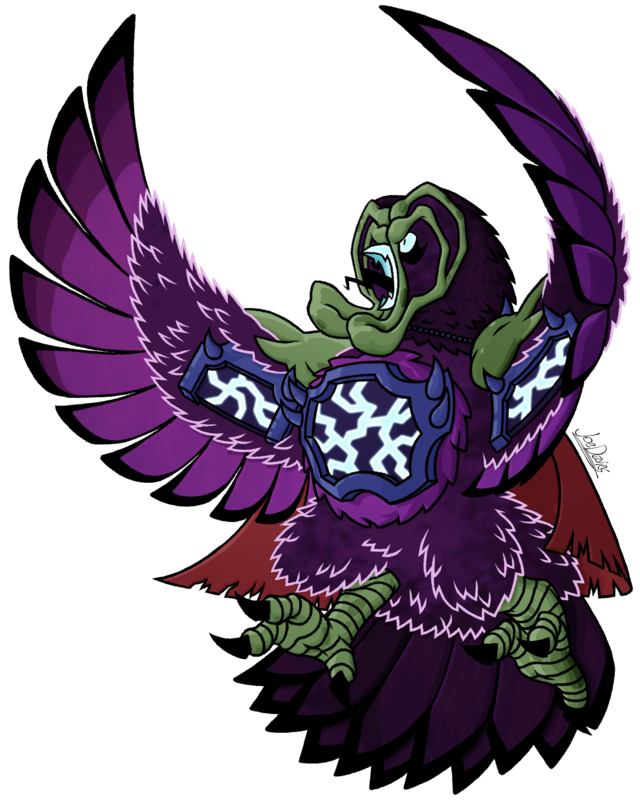 The skin parts are tainted green and spotty to reflect Stirrix’ skin, with the addition of wattles dangling from his beak that shows the gluttonous side of Stirrix’s appearance. He also inherited the cape and armour points from Stirrix’s design, and they are all positioned in the same place in his normal form on top of that. – While Toby looks like a Barn Owl, Stobyx’s appearance reflects that of a Great Grey Owl to symbolise his now predatorial disposition.